The Space Tracking and Surveillance System (STSS) - formerly known as SBIRS-Low - is designed to be a constellation of satellites in low-earth orbit, each having a very capable set of infrared and visible sensors for detecting and tracking ballistic missiles. As the only missile defense sensor system that is truly global, STSS is able to engage targets in all phases of their trajectory and in any geographic location. STSS's sensors and processors are able to detect, track and type the booster; track the post-boost vehicle; track midcourse re-entry vehicles and penetration aids; discriminate lethal objects from penetration aids; and perform hit assessment. The STSS contract calls for completing and launching two satellites (designated Cycle 1, Flights 1 and 2) in the FY06 and FY07 time frame. Evaluation of Cycle 1 performance will lead to recommendations for new technology insertions into satellites of following cycles and continued development of capabilities for the entire system. The Cycle 1 satellites will be integrated as part of the Ballistic Missile Defense System (BMDS) Block 2006 Test Bed. The BMDS test bed is designed to allow the assessment of the ballistic missile defense system elements alone and in concert with other assets as part of the layered missile defense architecture. The restructured STSS program builds on existing capabilities to lower the technical risk and enable an early deployment of a space-based missile tracking system. The existing capabilities in this case are satellite buses and infrared sensor payloads for Flights 1 and 2, which were developed during an earlier phase of the program as SBIRS-Low FDS. The acquisition sensor provides high resolution horizon-to-horizon coverage for detecting and tracking missiles in the boost phase. It has a wide field-of-view scanning refractive telescope with only one moving element. The shortwave infrared focal plane array is cooled by a passive cryoradiator/heatpipe system. After receiving a hand-over signal from the acquisition sensor or external cueing from other assets, the tracking sensor continues tracking a missile through the midcourse phase, including hit assessment. The tracking sensor features a narrow field of view and agile telescope, providing coverage below and above the horizon. The sensor is cooled to cryogenic temperatures so that it can detect dim objects in space, such as missiles after burnout and post-boost vehicles. These features are critical for discriminating lethal objects. 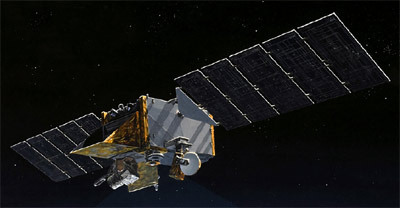 The first STSS satellites were scheduled for launch in 2006 – 2007, to be followed by enhanced capability satellites. The launch slipped to September 2009.